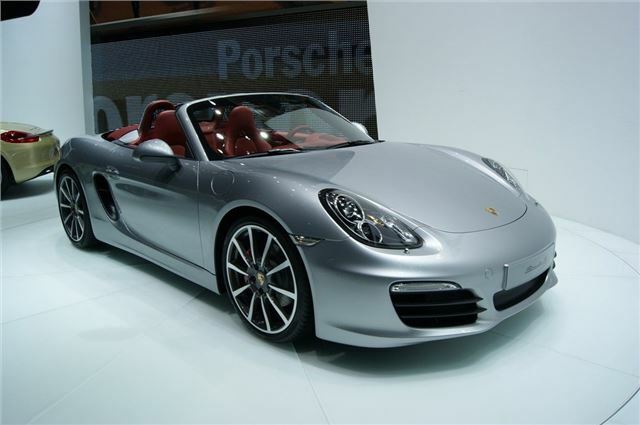 Porsche has officially launched the new Boxster at the Geneva Motor Show. It goes on sale in the UK in May and is priced at £37,589 for the Boxster while the more powerful Boxster S costs £45,384. While the overall shape hasn't changed too much, there are some key styling changes that make this new Boxster easy to distinguish from the outgoing version. It has new headlights and rear lights, shorter overhangs, a flatter profile plus the windscreen has been shifted forward. Inside there's a new fully electric roof which no longer needs a compartment lid when it is retracted, and the interior is more spacious. It also features a distinctive new centre console. The standard Boxster gets a new 2.7-litre engine with 265PS - an increase of 10PS compared to the 2.9-litre engine in the current model. It is based on the same 3.4-litre engine that's fitted in the more powerful Boxster S, which develops 315PS compared to 310PS previously. Both models have a six-speed gearbox as standard with the PDK seven-speed automatic available as an option. This Boxster is lighter than before with a longer wheelbase and a wider track. It also gets larger wheels, all of which are designed to improved handling further. The Boxster also get a new electro-mechanical power steering system first seen on the new 911. The dual-clutch PDK gearbox helps improve economy with the Boxster averaging 36.7mpg and the Boxster S returning a claimed 35.3mpg - impressive figures considering the performance on offer. Acceleration from 0-62mph takes just 5.7 seconds in the Boxster and an even quicker 5.0 seconds for the Boxster S.
As well as the new Boxster, Porsche showed the new 911 Cabriolet which is on sale now priced at £79,947 for the Carrera Cabriolet and £89,740 for the the Carrera S Cabriolet. This will sit alongside the Panamera GTS which is on sale now priced from £90,409.